American artist Richard Diebenkorn (1922-1993) is not well known in Europe, but in the US he is regarded as a bit of a master. His last major show in London was in 1991 but until 7th June 2015 you can see a selection of his works in the Sackler Wing of the Royal Academy. The best thing about going up to the Sackler Wing is the reminder that the Royal Academy owns a Michelangelo tondo. Tucked away on the top floor by the Sackler entrance it is hardly seen and little promoted – the sort of work that will only come to prominence when put up for sale. Then outrage will fuel a large financial campaign to keep it in the country. I recommend seeing this work (turn left at the top of the modern staircase), and once you have experienced this piece by a bona fide master you can mosey into the Sackler galleries and see what all the Diebenkorn fuss is about. Not too much is the answer. The exhibition has been curated by Sarah C. Bancroft and rather than being a retrospective is showing works from three main stages in Diebenkorn’s long career. His pieces are generally given a number and named after the place they were created, leading to uninspiring titles such as Albuquerque #7 or Ocean Park #27. This is a step up from Untitled, although there are plenty of those as well. The most interesting, a small abstracted landscape has been used by the RA to advertise the show on its website. Given a rare descriptive name – Sea Wall – it uses scuffled greens colours to give perspective and thicker paint in the sky to suggest atmospheric concerns. 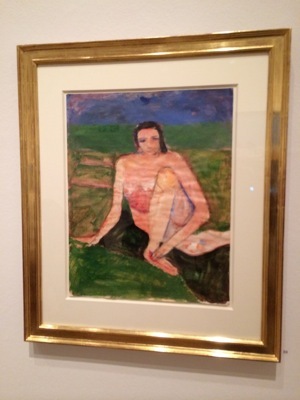 Diebenkorn’s work starts and ends in abstraction, but these pieces still retain an interest in figuration. One early piece appears abstract, but is actually…wait for it…based on an upside-down pig. This fact isn’t interesting enough to hold my attention. Other abstracts have a vibrant layering and use of boundaries and borders that could reflect fields and countryside seen from above. In the second room he drops the pretence. Unafraid to buck trends and go in his own direction he turned his back on the financially successful abstract work and – to the horror of his dealer – moved to undisguised figuration. These images are not a success and the room includes several unappealing, over-worked life drawings with little reason to hold your eye. Some of the works presented are shockingly poor. 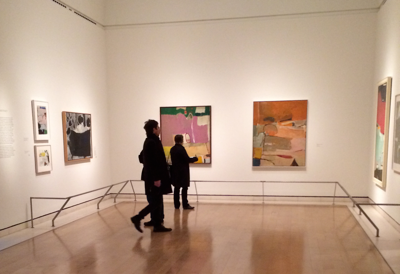 The final room shows some of the Ocean Park series of works, in which Diebenkorn returns to abstraction with a new pale palette and a very long ruler. Continuing the humourless theme the works reflect his move to a different climate in Southern California and a new studio with large windows. If you look carefully you can see these in the works. The most successful of his pieces, the calm colours and geometric outlines retain a sense of landscape and demonstrate his facility with colour. That success with colour and the change in his palette over time – reflecting the area he was living – is striking. But that’s about as interesting as things get. The Ocean Park images would work better without the two previous rooms to drain the viewer’s interest. Rather than this show I recommend the Rubens exhibition on the first floor instead. But more importantly, don’t forget to visit the Michelangelo Tondo.